Translating your Elementor website can be an intimidating prospect. This is especially true if you don’t happen to speak multiple languages yourself. What’s more, while there are a lot of ways to translate your site, not all of them are efficient or user-friendly. How easy and successful the process is, typically comes down to the tool you use. 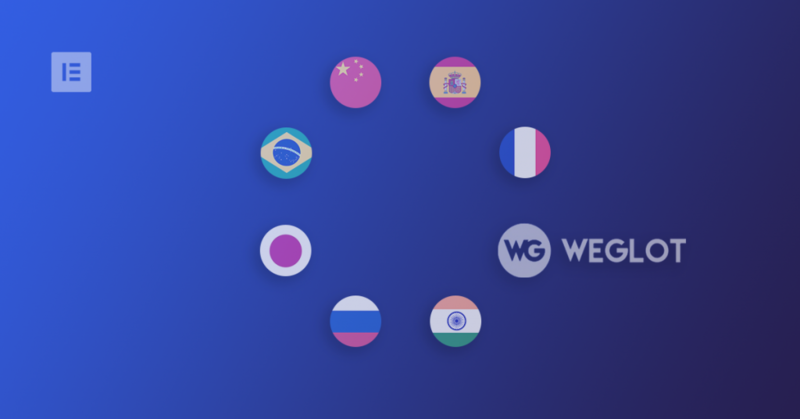 A dedicated translation plugin like Weglot can help you add multilingual content to your site quickly, without requiring you to go out and hire a team of translators. Plus, it can be used to translate all of your Elementor site’s content – not just your pages and posts. 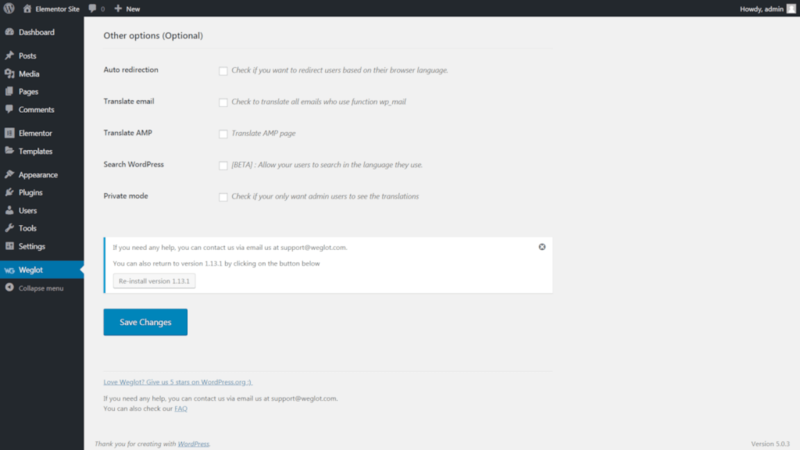 In this article, we’ll walk you through how to make your Elementor site multilingual by using the Weglot plugin. However, let’s firstly talk about why this is a crucial step to take! It’s no secret that the internet is a diverse and global resource. While English speakers are still the most common type of internet user, plenty of other languages are spoken by hundreds of thousands of the web’s denizens. At the same time, over 50% of websites primarily use English – even though far more than half of the internet’s users have another primary language. This means two things. First, there are a lot of people who might be interested in your website, who speak little to no English. Second, those same people have a disproportionately low number of sites serving their needs. You’ll extend the reach and visibility of your site, business, and/or brand. You’re likely to see increases to traffic, conversions, and other key metrics. Having versions of your content available in multiple languages can improve your site’s Search Engine Optimization (SEO). By translating your site, you’re helping to make the web as a whole more accessible to everyone. Nearly every site can benefit from being translated into one or more additional languages. However, this step is especially important for business and e-commerce sites. If you’re looking to gather a devoted audience and improve sales, it’s only logical to try and reach as many potential customers as you can. 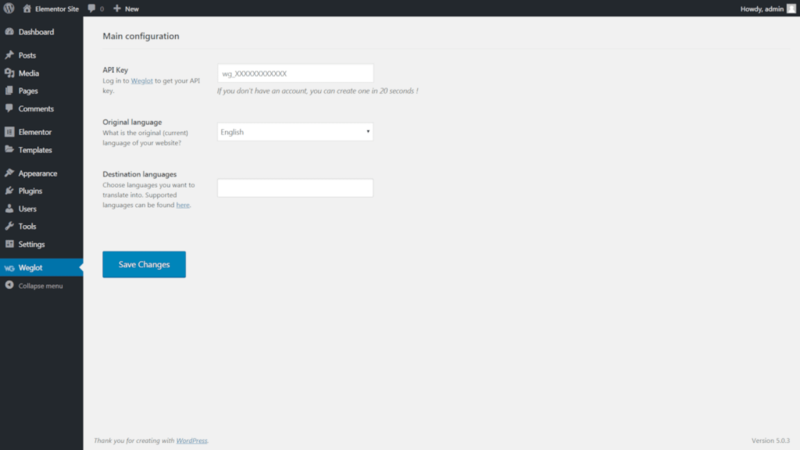 If you already have an Elementor website, you’ll know just how powerful WordPress plugins can be. 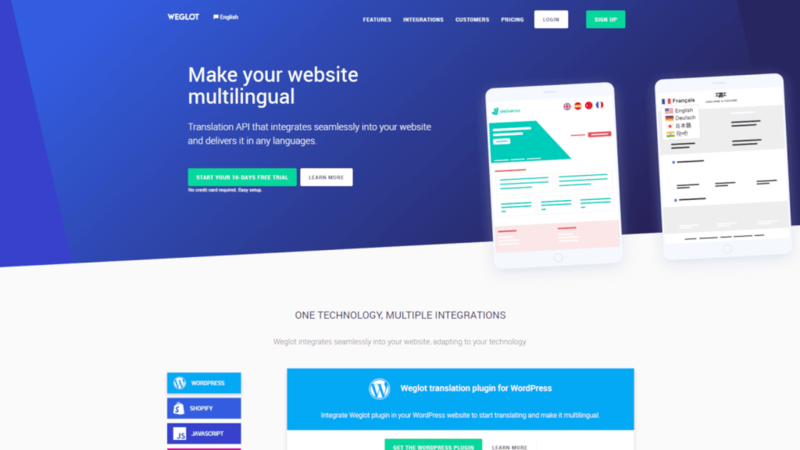 It probably won’t surprise you to learn that the best way to create translated versions of your site is to use a dedicated plugin. This is a faster, cheaper, and easier method than trying to put together a multilingual site manually. This plugin enables you to automatically translate your site’s content into multiple languages in just minutes. 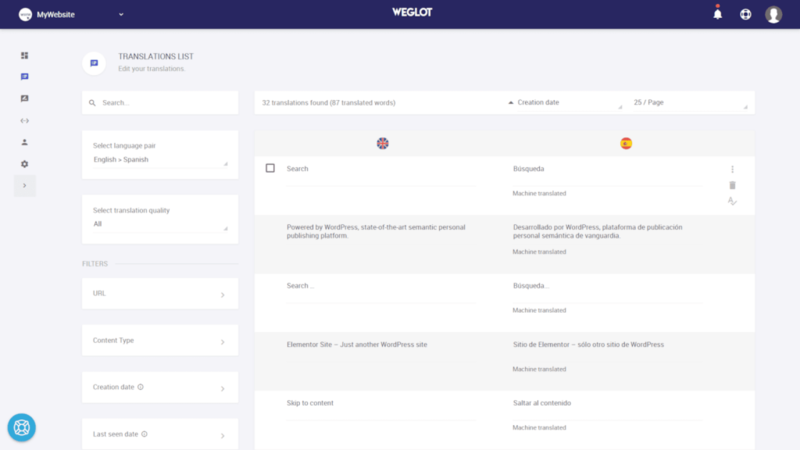 Most importantly, Weglot helps you translate all of your site’s content. This includes headers, footers, and content added via plugins – such as Elementor and WooCommerce. This makes Weglot an attractive option when compared to similar tools that will only translate your posts and pages. You can also try out Weglot for free, so you can see it in action without risking a thing. The free version will enable you to translate up to 2,000 words of content into one additional language. As for the premium version, it offers multiple tiers, so you only have to pay for as many languages and words as you need. Now we’ve covered the basics, it’s time to get a little more practical. Over the next three steps, we’ll walk you through the process of translating your Elementor site using the Weglot plugin. Let’s get to work! 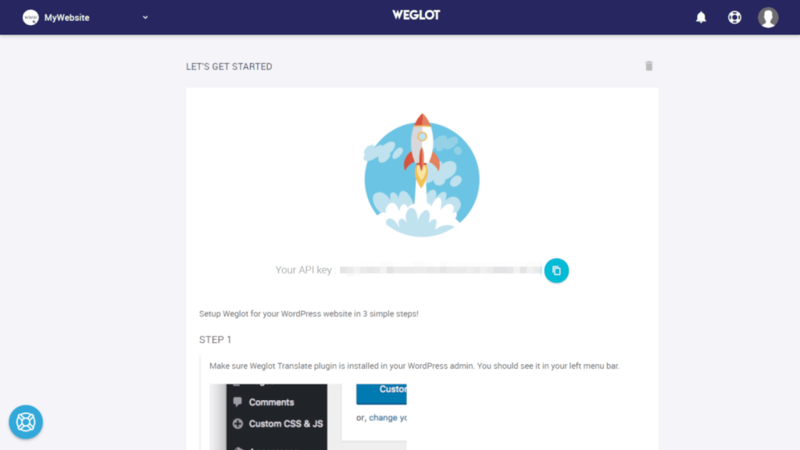 Naturally, the first thing you’ll want to do is install and activate the Weglot plugin. For the purposes of this tutorial, you can use either the free or the premium version. Copy this string, and paste it into the API Key field back in your site’s Weglot settings. Then, you can choose both the language your site currently uses, and the language(s) you’d like it to be translated into. Either way, save your changes here when you’re done. You should see a success message, at which point, you can move on to the next phase. This will include not only content within your pages and posts, but anything added as an Elementor element as well. While you can stop here, there’s still more you can do to customize the way Weglot works. First up, you can customize the way the language selector button works. This includes determining its location and appearance and deciding whether it will display the full names of the languages, or only abbreviations. Here you can set up redirections, enable users to search in multiple languages, and more. Most of these options are self-explanatory, but you can check out the plugin’s documentation for more details if you’re not sure what any of them do. You can make changes to any of the translated content right here. This enables you to give the machine-translated version a pass to make sure it’s accurate (since no automatic system is perfect). You can even access the Visual Editor in order to make changes directly on your website’s pages. This will be a familiar and welcome option for Elementor users, as you’ll already be used to working in a highly-visual interface. There are more options in the Weglot dashboard, which you’ll want to explore as well. You can add rules to govern the way translations work, and even hire professionals to ensure your translated content is as accurate as possible. 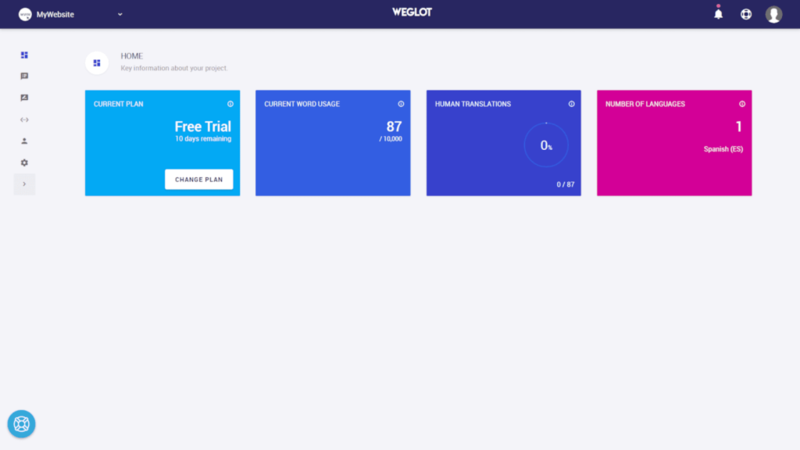 The nice thing about Weglot is it’s simple to get started with, but offers advanced options and functionality for those who have more complex needs. If you want your website to get noticed, you need to ensure that as many people as possible can find and interact with it. This involves creating excellent content, attending to SEO, and other key tasks – including translating your site into multiple languages. 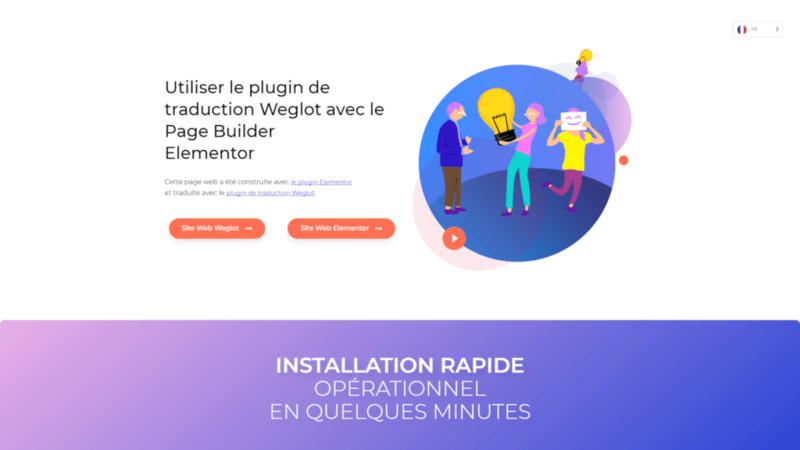 Installing and setting up the Weglot plugin. Do you have any questions about how to use Weglot on your Elementor site? Ask away in the comments section below! This is really painful problem getting solved. I feel I am crating more than one site when I have to translate pages. I will definitely bookmark this Will. Thanks for the article!